By using the fold-in method, you can incorporate the beaten, stiffed egg whites into other ingredients, like batter, without loosing the air in the egg whites. 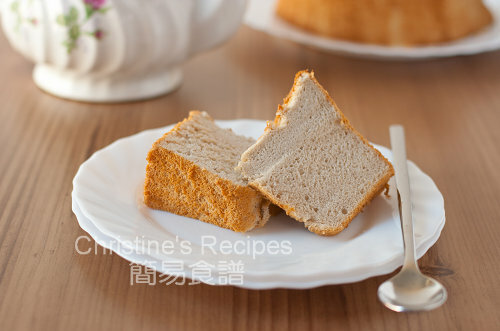 The air is what we love to have, that makes a soufflé or chiffon cake, Swiss roll, soft and fluffy. Some readers asked me what “fold-in” is, and how exactly it should be taken into action. Yes, it's different from stirring. As I baked a banana chiffon the other day, I took a video clip of how I went about folding-in the egg whites into the batter. Hope it helps. Use a spatula, either scrape down from the sides of your bowl or just vertically cut down in the middle. Bring up the batter from the bottom over the top and fold it in, until the egg whites completely mixed in. The mixture should be smooth, and you can't see any egg whites in it. While you do this folding action along the way, continuously turn the bowl in order to help the egg whites mix evenly and quickly into other ingredients. Add in a portion of egg whites at a time. After the portion is completely folded in, you can add another portion. Don’t stir it vigorously, but fold lightly with care. The little air bubbles would be deflated otherwise. Great job on the video Christine. I just want to dip my finger in the batter and take a taste. Thanks for the video! I fold in that manner as well, but was never quite sure if I was doing it right. Now I know that it is! My chiffon cakes never stand tall and proud tho. Sigh. That's the way I fold my egg whites in ! But I never knew if I was doing it right or wrong. Thanks for that, now I know I've done it the right way. Tho even with the correct folding, I'm still not getting pretty chiffon cakes that stand tall. Sigh. I just wanna thank you for the Cantonese Egg Tart Recipe. The comment box was clsoe for that post but no, I have to comment it here and tell you how good and delicious it was. Everything was perfectly good! Thanks again, you're amazing! I mean it! thanks Christine for the video, I must keep trying until I get it right :). Cool video! A very practical entry. Thanks. very informative video and tips! Thanks! thx for sharing, very useful to have video demo. May I know what brand is your spatula and where did you buy it? It's no brand. I just got it from a nearby bakery shop. You might get one from eBay or Amazon, like these.